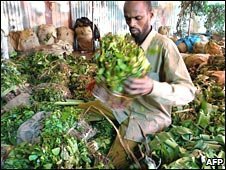 A crackdown has been launched in the Ethiopian capital on unlicensed parlours where boys and young men chew khat, a narcotic green leaf. Addis Ababa city council has ordered raids on the backrooms where people also smoke shisha pipes and gamble. Although khat is not banned, officials say boys skip school and steal to fund their pleasures in the parlours. Other illegal activities such as trading stolen mobile phones are also reported to take place in khat dens. The mild narcotic - which can cause users to experience excitement, euphoria and loss of appetite - is popular in parts of East Africa, especially Somalia, and Yemen. During the clampdown in Addis Ababa, where the cheap narcotic has recently become popular with the young jobless, the BBC's Elizabeth Blunt saw shisha pipes being smashed, while playing cards and khat were burned. Police have been slapping notices on the doors of unlicensed khat parlours, although the leaf is still openly sold on the streets. The police have no way of stopping people sitting by the side of the road and chewing the drug. Addis Ababa city council's head of justice and legal affairs Tsegaye HaileMariam made it fairly clear to our correspondent that he wished khat was a banned substance in Ethiopia. However, exports of the drug bring in large amounts of foreign currency. Muslims from the eastern Ethiopian city of Harar and the Somali region to the south-east chew the leaf as part of their culture. In those areas, our correspondent says, the cream of society retires after lunch to rooms elegantly prepared with low couches and cushions to munch khat, drink sweet tea and smoke shisha pipes, while discussing the issues of the day. She adds MPs, senior officials, security chiefs and university professors have invited her to join them in chewing khat. But the use of the drug is now spreading to new areas of the country.